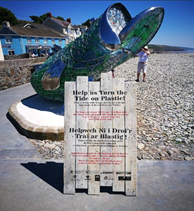 A bilingual interpretation board explains the impact that plastics have on marine life and encourages readers to take action, registering their commitment by taking “selfies” next to the sculpture to post on social media with United Nations hashtag #clean seas. The sculpture is backed up by an associated teaching resource for use by local schools. 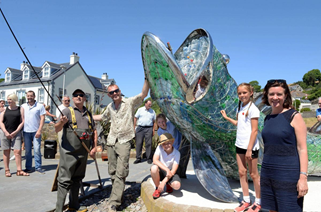 “Bertie” has now begun a tour of locations on the Pembrokeshire Coast in response to requests from other Community Councils to use the sculpture as a focal point to promote the Clean Seas message and returns to Amroth in July 2019. In addition, a Clean Seas Pledge has been made by both Community Councils and promoted to local business in each Council area. 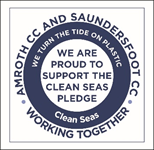 The Clean Seas pledge required businesses in Amroth and Saundersfoot to commit to 3 actions to reduce single use plastic, with each signatory receiving a Clean Seas window sticker. All local food and drink outlets signed up to the pledge and now display the sticker. The Community Councils have also worked closely with local business and the County Council to operate the “2 Minute beach clean” and with Surfers Against Sewage to run regular volunteer beach cleans. 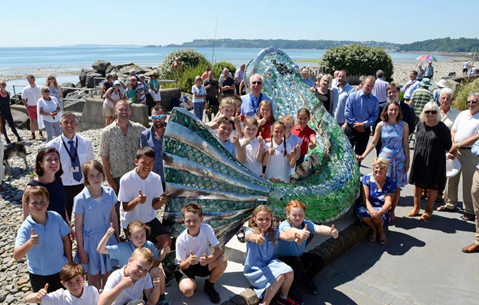 The project has enhanced the visitor experience through cleaner beaches, while “Bertie” has become a visitor attraction and demonstrated the power of Community Councils to take leadership action on a critical environmental issue.